A strange Imam indeed. He publicly states that Islam is a dangerous religion. He wants to close all Islamic schools and believes that no more mosques should be built in Australia. He complains that Muslims in Australia are not protesting against ISIS. He believes that all of Palestine belongs to Israel, and he claims that his father would not have moved to Australia if he had known that so many Muslims would live there in the future. ‘My father wouldn’t have moved from Iran to Australia if he’d known there’d be so many Muslims here’. He makes an interesting slip of the tongue while speaking on the video above. He says that he does not understand “why Muslims believe” that they go to heaven by blowing themselves up but corrects himself and says “well radical Muslims”. Interesting slip of the tongue. By “accident” he claims that all Muslims are terrorists. The slip of the tongue is understandable if you know that Shaikh M. Tawhidi supports a racist political party that hates Muslims. 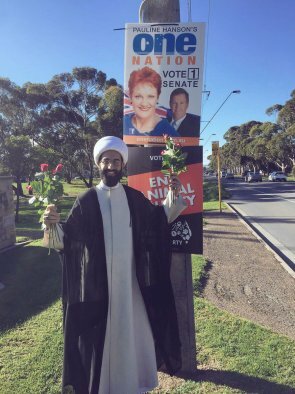 Below is one picture he posted on social media recently, when he made offerings of roses to One Nation posters. One Nation is a radical rightwing party in Australia that hates Muslims. 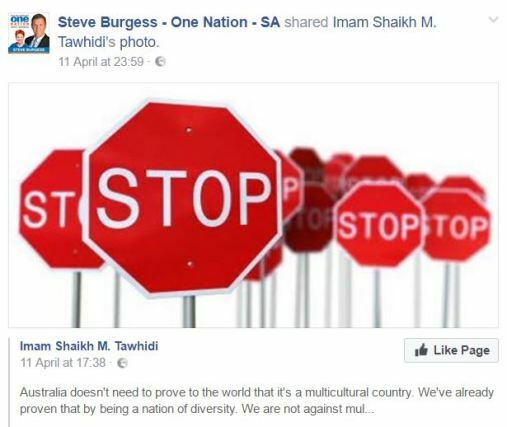 He supports One Nation and apparently they like him, or what should we say about the frequent posts by the party representative in South Australia praising the imam? With his gold-trimmed white robes and pointed turban, the man who calls himself both an Imam and Sheikh cuts an elegant figure as a minder guides him out of the car, past more jubilant Koreans and television cameras, and into the surreal surrounds of an Olympic stadium filled to capacity, where tens of thousands of seated spectators holding coloured cards form a gargantuan human LCD screen. Here he is ushered to pose for photographs with other similarly well turned-out men of faith, all of whom have been flown in from religious communities across the globe to take part in the World Alliance of Religions Peace (WARP) summit. But the cheer squads are not really here for Tawhidi, and this is not really a peace conference. These ecstatic young Koreans are members of an allegedly dangerous religious cult taking part in a highly regimented North Korean-style stadium extravaganza to pay tribute to their controversial leader, Lee Man Hee. Well I can agree with one thing the “Imam” says: we certainly need to scrutinize some of the Imams in Australia. 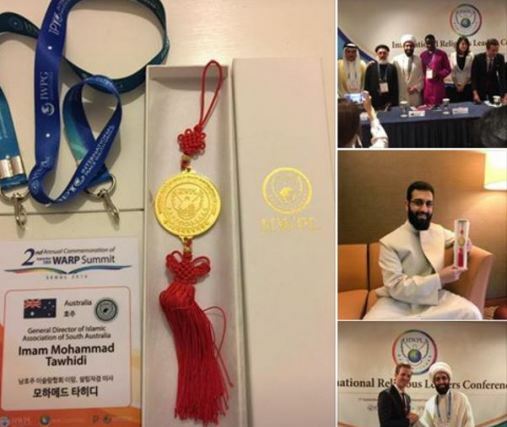 Lets begin with the imam Shaikh M. Tawhidi! Who funds him? And why? Seems to be a fraud. Go see for yourself mate. I am thoroughly confused. Looks like I’ve got a new project – trying to figure out who this dude is. Again, I am thoroughly confused. Definitely not a muslim. He got exposed on facebook by the muslim community though. Lol this guy is claiming to be a Muslim, a man who demonises his own religion. This man is not a Muslim. Given the ignorance in his comments about Islam and Muslims, it seems unlikely that Tawhidi ever was a Muslim (or at least not much of one). There is no ambiguity about his Zionism though – a very common theme among the detractors of Islam and Muslims. His claim of being a “Muslim” seems to be based on nothing besides his cultural identity, which he likely claims because of his “Muslim background”. By adding “cultural identity” to the definition of a “Muslim”, coming from a “Muslim background” is enough for someone to make the claim of being one, regardless of what they actually do, say and believe. 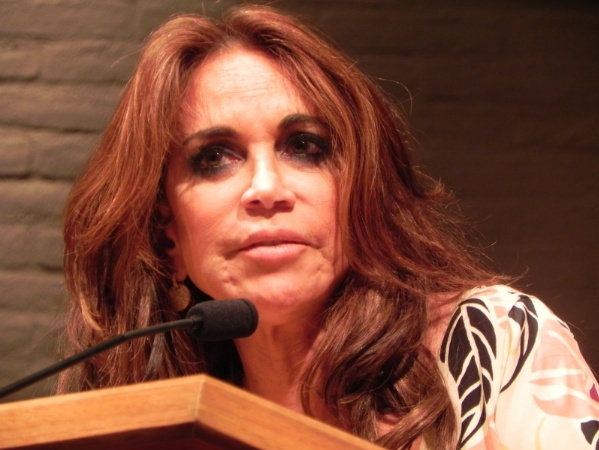 At best, they are only trying to avert being alienated by other Muslims. At worst, it is another tactic used against Islam. In the case of Tawhidi, it is more likely the latter. I guess if one were to put on a pope costume they could then claim to be Pope.